Last spring I reviewed Marc Vetri's newest cookbook Mastering Pasta, creating his rendition of Eggplant and Parmesan Rotolo, a unique spin on eggplant Parmesan. It was excellent, and enticed me to continue cooking from the book. I followed up with a simple Fettuccine with Corn Crema and Charred Green Onions. This easy-to-make pasta dish really encompasses the flavors of late summer. Now as winter is approaching, I'm read to embrace all my favorite comfort foods, chock full of winter ingredients. Cabbage and sausage always makes me think of winter (and Germans, of course). 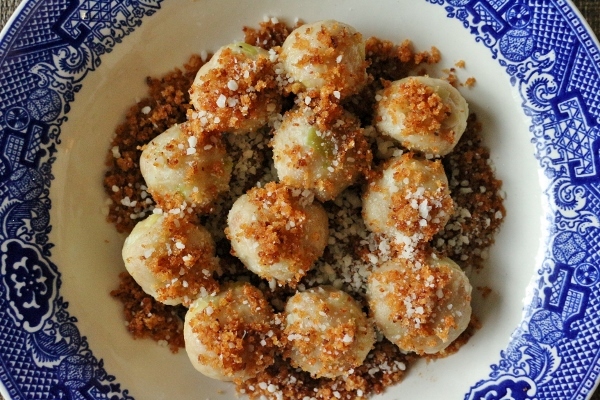 When reading the book, this Cabbage Gnocchi with Sausage and Toasted Bread Crumbs really stood out, but last spring it just wasn't the right time of year to make this creative take on gnocchi. For the record, making gnocchi with bread as the base is not uncommon, and is quite popular in the cooler northern regions of Italy (near the Alps). With that said, it's not really surprising to see that style of gnocchi made using other ingredients that are prevalent in Alpine regions of Europe. A combination of blanched cabbage and sauteed sausage make up the bulk of this gnocchi, while the milk-soaked bread really holds it all together, along with beaten egg. I used Italian-style chicken sausage instead of pork, but you could definitely use either. 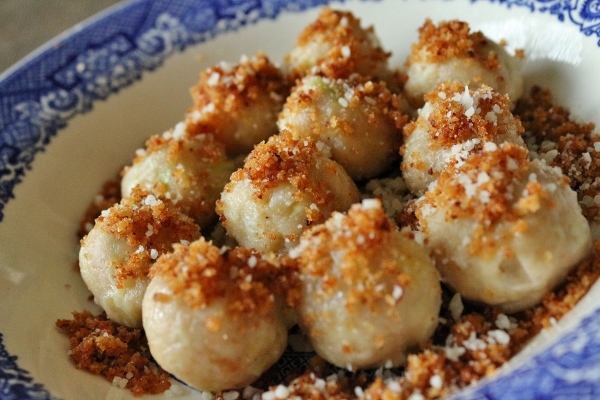 Considering the fact that the sausage is cooked and then finely chopped to mix into the gnocchi "dough," you don't really end up tasting much sausage in the final result. The cabbage does hold its own mainly due to its texture (some of mine still had a bit of bite to it). These gnocchi are delicate, yet chewy--not the tender morsels you get with potato or ricotta-based nuggets. They are served relatively naked, although you can easily drizzle brown butter over the top before finishing with the toasted bread crumbs (that's what I did). The toasted bread crumbs are paramount here because they produce the most texture. *Update 1/15/16* I actually recently made these again and topped them with a bit of simple garlicky tomato sauce before topping with the bread crumbs, and I preferred them even more this way! 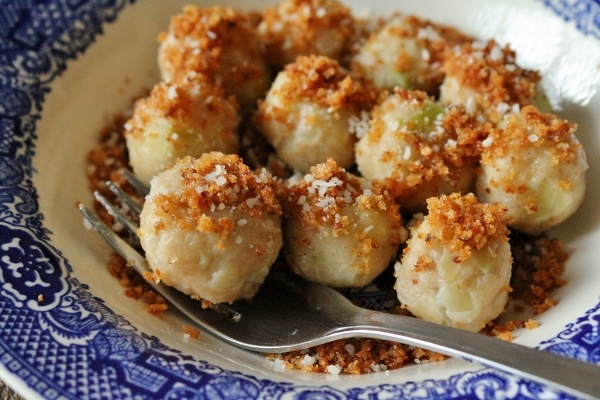 If you're looking for a really creative variation on gnocchi, these cabbage gnocchi are relatively simple to make and utilize some of my favorite comfort-inspiring ingredients. They also freeze really well! Bring a large pot of salted water to a boil. Add the cabbage and boil until the leaves are tender, 4 to 5 minutes. Remove the pot from the heat and transfer the cabbage to a cutting board. When cool enough to handle, trim out the tough, woody core and stems and discard. Finely chop the tender leaves. You should have about 1 1/2 cups chopped (150 g). Soak the bread in the milk in a bowl for 5 minutes. Squeeze out the bread like a sponge to remove as much milk as possible, wringing it in cheesecloth if necessary to remove and discard all the milk. Set the bread aside. In a sauté pan over medium heat, cook the sausage and garlic clove until the sausage is cooked through. 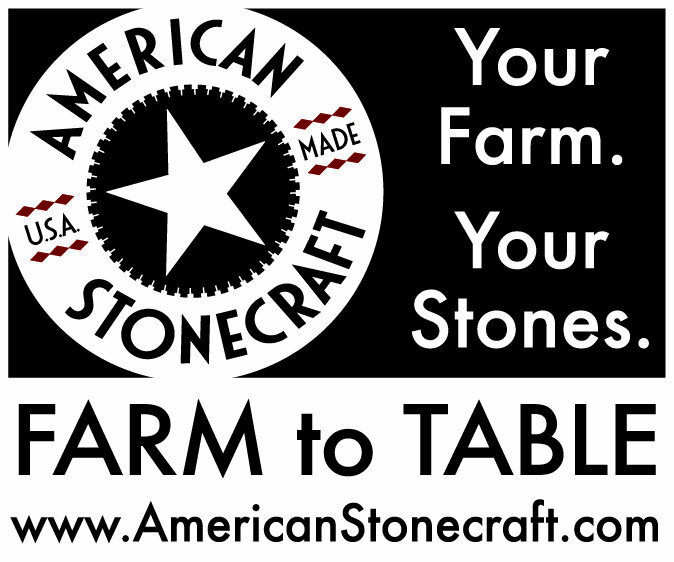 Transfer to a cutting board and finely chop it. Discard the garlic. 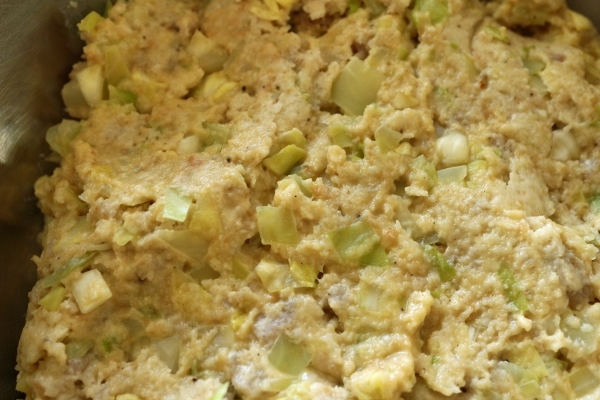 Combine the bread, cabbage, sausage, and flour in a bowl and stir with a wooden spoon until fully mixed. If the bread doesn’t fall apart, mash it with the spoon until it does. Taste the dough, adding salt and pepper until it tastes good to you. Stir in the eggs. Cover and refrigerate the dough for at least 2 hours or up to 24 hours. Melt the butter in a sauté pan over medium heat. Add the bread crumbs and cook, stirring now and then, until they are toasted and golden brown, 4 to 5 minutes. Remove from the heat and set aside. Spoon 1-inch (2.5 cm) dollops of dough into a bowl of flour. Gently scoop up a dollop with floured hands (the dough will be loose), roll the dollop into a ball, and then place it on a floured rimmed baking sheet. You should have 50 to 60 gnocchi (I yielded closer to 75). 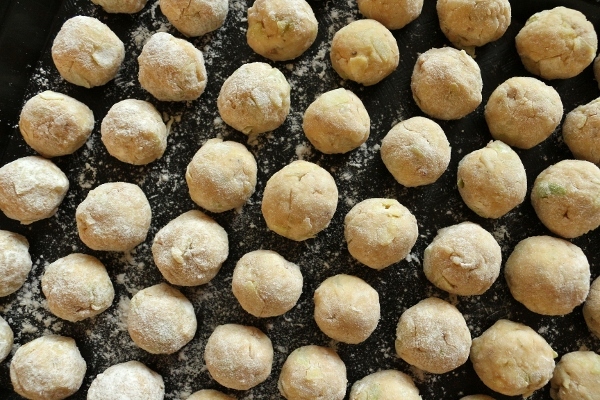 Use the gnocchi immediately or cover them loosely and refrigerate them for a few hours. You can also freeze them in a single layer, transfer them to a zipper-lock bag, and freeze them for up to 2 weeks. Take the gnocchi straight from the freezer to the boiling water, adding 30 seconds or so to the cooking time. Bring a large pot of salted water to a boil. Working in batches to prevent crowding, drop in the gnocchi and cover the pot to quickly return the water to a low boil. 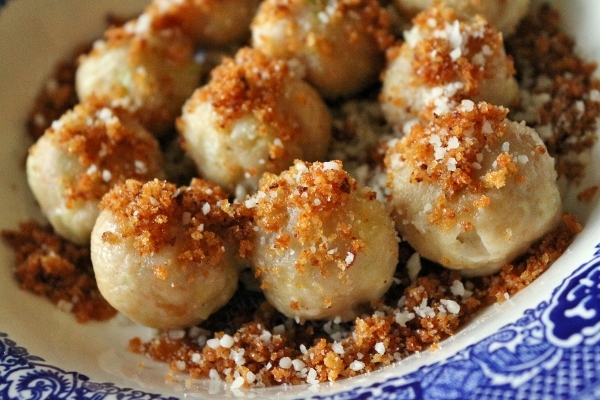 Gently cook the gnocchi until springy to the touch and tender throughout, 3 to 5 minutes. Squeeze a dumpling between your fingers. It should have some bounce-back. If it just flattens, the gnocchi are not done yet. Using a spider strainer or slotted spoon, drain the gnocchi, letting them drip-dry for a moment, then dish them out onto warmed plates. 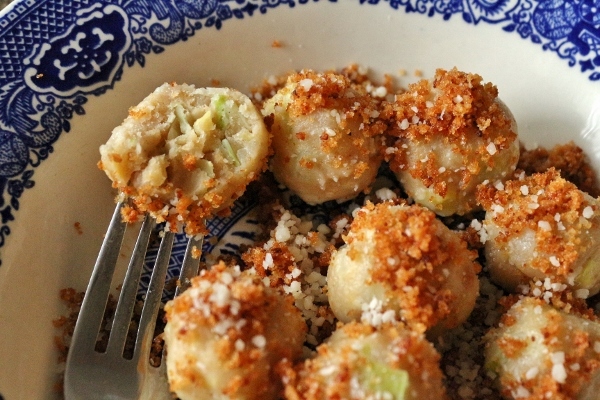 Top each serving with a spoonful of the bread crumbs and some Parmesan.